Everyman Theatre | Does This Font Make Me Look Fat? 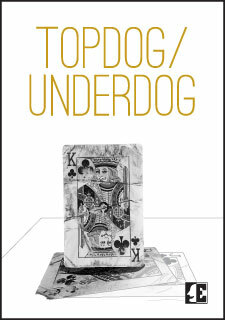 The show now at Everyman Theatre, Topdog/Underdog, by Suzan-Lori Parks is incredible. Only two actors, Kenyatta Rogers and Eric Berryman, are on stage and carry the show to it’s stunning, but inevitable, conclusion. Parks won a Pulitzer Prize for this play, which was first produced in New York in 2001. This is its first Baltimore production. Since I had been to Dara Marks workshop the day before I saw this play, I was thinking transformational arc. At the end of Topdog/Underdog there is no redemption, but I remembered Dara saying there doesn’t always have to be; this was a tragedy after all. It would have made me feel better if there had been some ray of hope for these brothers, but their backgrounds, life experiences, and lack of opportunities made the ending an almost forgone conclusion. The day I saw the play was Mother’s Day. We were in the new Everyman Theatre on Fayette Street in Baltimore so there is more handicapped accessibility. A family brought their elderly mother and parked her wheelchair across the aisle from us. A nice outing for mom, right? As soon as the play started the woman dropped her head and slept through the entire show. I was glad because the language in the play, while authentic, would have scorched the ears of any woman her age. And the subject matter was not uplifting. That family would have been better off taking mom to brunch and giving her a blooming plant. Plays are story telling and whatever project Laura and I are working on, it’s always about story. Any time we can observe how someone else makes it work is instructive, so we watch TV, go to the movies and to the theater. We hope it will make us better writers and story tellers.TopDog/Underdog at Everyman had lessons we will use. This entry was posted in Acting, Humor, Personal, Uncategorized, Writing Tips and tagged cross-pollination, Dara Marks, Eric Berryman, Kenyatta Rogers, Laura Ambler, Mala Burt, Suzan-Lori Parks, three card monte, Topdog/Underdog, writing resources by Mala Burt. Bookmark the permalink.